Question: How does exposure to different salinities affect the survival of Gracilaria? Hypothesis: Gracilaria will experience higher rates of bleaching (or loss of color) in fresh water because this is not its normal environmental conditions. Samples are stored in well plates during the duration of the experiment. Every day samples are examined and scored meaning samples are given a rating of how healthy they appear to be. To the left, Aaron records his daily observations in a chart with all the samples listed. 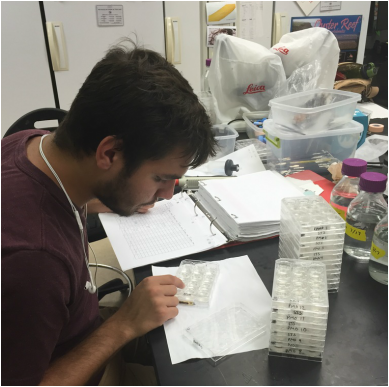 After examining, most samples appeared healthy when exposed to lower salinities after Day 1 or Day 2 (Score 1). Day 4 samples appeared okay (Score = 2). However by Day 6, some samples began bleaching (turning lighter green, bleaching) and appeared unhealthy, therefore were given a score of 3. Bleaching occurs in fresh water (0ppt). Some bleaching occurs in samples exposed 5ppt. Not much bleaching happens in the upper salinities (10-30ppt). 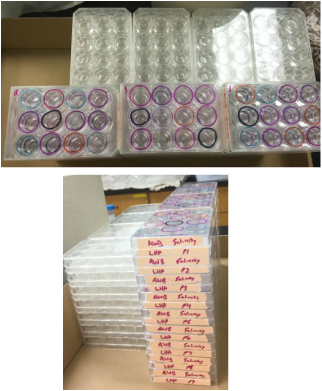 Because samples do not appear unhealthy when exposed to salinities of 10-30ppt, Aaron will be using a method to hopefully gain more insight on the health of these samples! He will be using PAM to measure how much the samples are photosynthesizing which indicates how healthy the plants are after going through this assay. The amount each sample can photosynthesize may change depending on the salinity conditions.